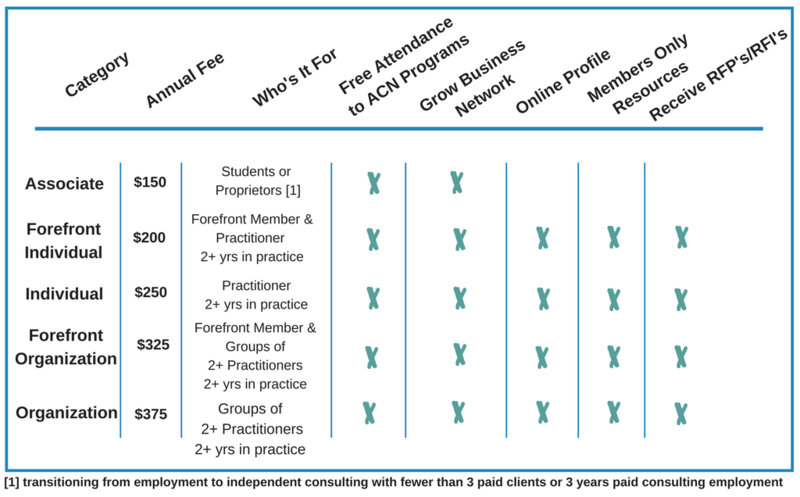 building your practice to winding down – we have a membership level for you. Forefront is building a vibrant social impact sector for all the people in Illinois through four key strategies: Attracting Investment to the Sector, Developing Top Talent, Improving Systems and Policies, and Building Organizational Capacity. Forefront provides education, advocacy, thought-leadership, and project management, working closely with our Members and collaborating with government, business, social enterprises, and other allies. Annual Meeting Discount will be available. Discounts from program partners including Forefront; access to RFPs submitted by area nonprofits. Sole practitioners who are transitioning from employment to independent consulting with few then 3 yrs paid consulting employment.